"Arabia" redirects here. For other uses, see Arabia (disambiguation). "Arabian" redirects here. For other uses, see Arab (disambiguation). Yemen, the sole republic on the peninsula. In 2008 The Arabian Peninsula population has been stated as 69,550,249. "According to this, Arabia was originally a land of great fertility and the first home of the Semitic peoples. Through the millennia it has been undergoing a process of steady desiccation, a drying up of wealth and waterways and a spread of the desert at the expense of the cultivable land. The declining productivity of the peninsula, together with the increase in the number of the inhabitants, led to a series of crises of overpopulation and consequently to a recurring cycle of invasions of the neighbouring countries by the Semitic peoples of the peninsula. It was these crises that carried the Assyrians, Aramaeans, Canaanites (including the Phoenicians), and finally the Arabs themselves into the Fertile Crescent." Shamir of Dhu-Raydan and Himyar had called in the help of the clans of Habashat for war against the kings of Saba; but Ilmuqah granted . . . the submission of Shamir of Dhu-Raydan and the clans of Habashat. The oil boom in Kuwait converted Kuwait City from a small city to a financial hub. a central plateau, known as Nejd, with fertile valleys and pastures used for the grazing of sheep and other livestock. a range of deserts, the Nefud in the north, stony; the Rub' Al-Khali or Great Arabian Desert, in the south, with sand estimated to extend 600 ft. below the surface; and between them, the Dahna. stretches of dry or marshy coastland with coral reefs on the Red Sea side (Tihamah). ranges of mountains, primarily paralleling the Red Sea on the western (e.g. Asir province) and southeastern end (Oman). The highest, Jabal Al-Nabi Sho'aib in Yemen, is 3666 m high. Most of the Arabian Peninsula is unsuited to settled agriculture, making irrigation and land reclamation projects essential. The narrow coastal plain and isolated oases, amounting to less than 1% of the land area, are used to cultivate grains, coffee and exotic fruits. Goats, sheep, and camels are widespread throughout the region. The fertile soils of Yemen have encouraged settlement of almost all of the land from sea level up to the mountains at 10,000 feet. In the higher reaches elaborate terraces have been constructed to facilitate crop cultivation. The extraction and refining of oil and gas are the major industrial activities in the Arabian Peninsula. The region also has an active construction sector, with many cities reflecting the wealth generated by the oil industry. The service sector is dominated by financial and technical institutions, which, like the construction sector, mainly serve the oil industry. Traditional handicrafts such as carpet-weaving are found in rural areas. ^ Stuart Munro-Hay. Aksum: A Civilization of Late Antiquity. Edinburgh: University Press. 1991. pp. 66. ^ The Seas of Sindbad. Retrieved on 2006-12-11. ^ Foreign Experts Talk of Siraf History. Cultural Heritage News Agency. Retrieved on 2006-12-11. Global Nomads - Multi-media website documenting the current perspective of living in a diverse Oil Company Expatriate Community. 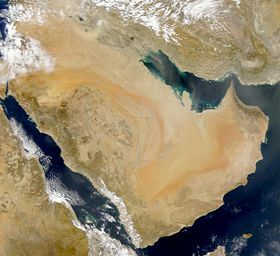 Arabian Peninsula, great desert peninsula in extreme south-west Asia, bordered on the north by Jordan and Iraq, on the east by the Persian Gulf and the Gulf of Oman, on the south by the Arabian Sea and the Gulf of Aden, and on the west by the Red Sea. The peninsula is essentially a vast plateau, bordered on the west and south by mountains that rise steeply from the Red Sea. Originating from the Arabian peninsula, the Semitic people are responsible for teh first civilizations, three major world relgions, and a set of cultural practices that have been more globalized or universalized than any other peoples, including the Chinese and Europeans. The Arabian peninsula is probably the last place one would nominate as a cradle of the most influential of human cultures, for it is a harsh and demanding place to live. The overwhelming geographical aspect of the Arabian peninsula is water, or rather the lack of water.